Greenville, NC Bojangles'® Tands, INC. Store #38 - Bojangles'® / Tands, Inc.
Hungry for some southern fried chicken? Swing by Bojangles’® in Greenville, NC for delicious Cajun fried chicken and buttermilk biscuits baked daily from scratch. 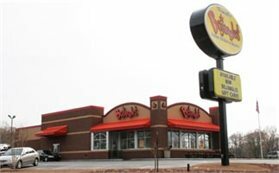 This Bojangles’® is located near ECU and North Campus Crossing and is a favorite hangout for students and Pirates fans. The Bojangles’® menu includes options for breakfast, lunch and dinner, so no matter what time of day it is, it’s still Bo Time! Stop by Bojangles’® today to curb your cravings! You can always expect quality service and fresh, delicious food at Bojangles’® in Greenville, NC.